What soft skills are needed for cooperation in Super7 teams – what soft skills are essential for a team to reach cooperational excellence? The implementation Super7 Operations (link) within the operations departments of one of the leading Dutch retail banks is in full swing. Many things need to be taken care of in the preparation phase: small, autonomous production teams (Super7’s) arent’ formed overnight. But one thing in particular is essential for a smooth introduction of Super7 Operations: attention to the soft skills that are needed for working together in a small, autonomous team. This entry was posted in Lean, Operational Management, Teamwork & cooperative models and tagged Lean, operational excellence, Super Seven, Super7, Super7 Operations, Teams, Teamwork on January 26, 2014 by M.R. van Dijk. Kata coaching is especially useful in the implementation of Super7 Operations. The theory and examples of Kata coaching can be found on www.lean.org/kata or in the excellent books and you-tube posts of Mike Rother. Recently, I’ve applied Kata coaching during an implementation project of Super7 Operations. Every week, I used the Improvement Kata questions to challenge the team managers to make one improvement step on each of the 7 principle elements of Super7 Operations. And in turn, the team managers have used Kata coaching questions to get their teams to improve. 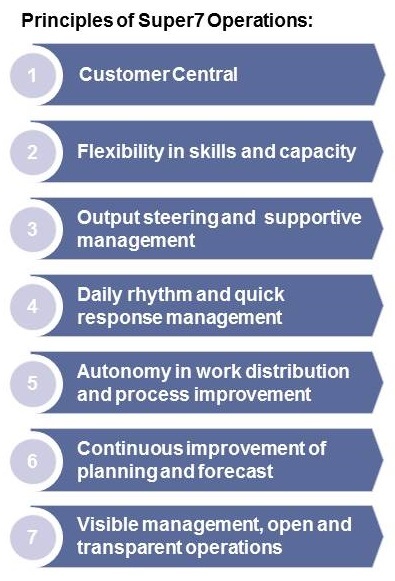 The effect of applying the Kata coaching questions to the 7 principles of Super7 Operations was impressive: not only did this lead to exiting improvement experiments on the shop floor, but it had a profound effect on morale as well. I have found that Kata coaching is an effective way to get and keep things moving towards the desired direction. It just isn’t possible to implement perfection in one blow, and this isn’t any different for Super7 Operations. Customer is central: The Super7 team has a goal that is relevant for the customer. Super 7 team is autonomous in work distribution and in imporving the way of working. Continuous improvement of performance, supported by planning and forecasting. Visible management to create openness, transparancy and Super 7 team pride. What does perfection look like to you on this element of Super7 Operations? How does the current situation look like? Where do you want to be next week on the development of this element of Super7 Operations and, what obstacles are in your way? What action or experiment will you undertake to get to where you want to be next week? What do you expect from this action? This entry was posted in Lean, Operational Management, Teamwork & cooperative models and tagged Kata, Lean, Lean Six Sigma, Menno R. van Dijk, operational excellence, Super7, Super7 Operations on January 21, 2014 by M.R. van Dijk. The 7 principles of Super7 Operations – what does good look like? Successful implementation of Super 7 Operations – the next step for lean in financial services – depends on the introduction of all 7 principles of Super7 Operations: 1. Customer central, 2. Felxibility in skills and capacity, 3. Output steering and supportive management, 4. Daily rhythm and quick response management, 5. 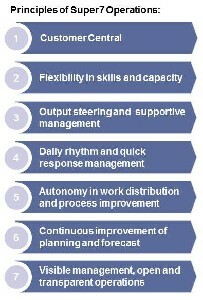 Autonomy in work distribution and process improvement, 6. Continous improvement of planning and forecast, 7. Visual management – open and transparent operations. Naturally, the introduction of the principles of Super 7 Operations is best done step-wise. However, it’s good to start with the end in mind: what does good look like in Super 7 Operations? The Super7 team has a goal that is relevant for the customer. The Super 7 team can help each other in achieving this goal. The goal is translated daily to a goal for that day. The Super7 team is committed to achieving the daily goal. When problems arise during the day and the daily goal can’t be met, the Super 7 team responses by doing what they can to come as close as possible to the goal. When that isn’t enough to reach the goal, they ask for help from their team manager. The request for help is quantitative and specific. For instance: we come 6 hours short, we solve 4 hours ourselves and ask for 2 hours help from another team. All Super 7 team members have the skills for all types of work. The Super7 Skills-Matrix shows who can do what, and at what skill level. The Super 7 team members are sufficiently flexible in working hours to be able to meet customer demand on busy days. Team manager steers on output. Manager stimulates the Super 7 team to come up with solutions. Manager is available and helpful when the Super7 asks for help. The daily rhythm is adjusted to the rhythm of the customer requests. There is a fixed schedule for Super 7 team stand-up meetings, focused on achieving the daily goal. When incidents happen, the department responses quickly in constructive and effective dialogue between Super7 team and their manager, and subsequently between the team managers and the department head. Super 7 team is autonomous in work distribution and who does what. There is a standard way of working. The team can deviate from this standard, as part of an improvement experiment. The duration of this experiment is known beforehand (optimally 1 week). Evaluation is based on facts and figures. Most important outcome, however, is what the Super7 team has learned from the experiment. The Super 7 team is stimulated to continuously make the daily goals more challenging. Standard norm times are improved and planning is made tighter. Work is planned based on forecast. The organization continuously strives towards improved forecast accuracy and improved performance. Performance is discussed on all level of the organization. The Super 7 team board is neat and easy to read. Daily goal and progress towards this is visible on the Super7 team board. Performance of last period is visible, as is the trend. Running and planned experiments and improvements are visible on the Super7 team board. Fixed lines are made with tape, fixed headers are printed. More on Super7 principles? My book on Super7 Operation – the Next Step for Lean in Financial Services – is available in bookstores! This entry was posted in Lean, Operational Management, Teamwork & cooperative models and tagged lean. super7, operational management, super 7, Super Seven, Super7 Operations, Super7ops on January 15, 2014 by M.R. van Dijk. Flexibility to cope with fluctuation: what does this mean for employees? Customer demand can fluctuate enormously: with Super7 Operations, we try to cope with the fluctuation by making our operations capacity as flexible as possible. But what does this mean for the employees? Perhaps it’s good to share our experiences from recent implementations of Super7 Operations within a large Dutch retail bank. Because the work is planned on forecast, the small autonomous Super7 teams have some idea in advance of how much capacity they need to deliver each day. The more accurate the forecast is, the easier it is to create a roster that everybody is happy with. But planning ahead on forecast isn’t easy. The reality is that the actual working hours per day can be somewhat unpredictable. Naturally, this doesn’t always mean working longer, there is an equal chance of going home earlier because there is less work than planned. The reality is that working predictable hours isn’t possible anymore. The truth is that customers in financial services expect faster response and better service than before the banking crisis. The team members within a Super7 team can help each other out and compensate when one of the team members needs to be home on time. This can’t be a daily recurrence, however. For people with young children, this often means that they need to find back-up arrangements with their partner, neighbors or grandparents to pick up the kids from the daycare, for instance. In a recent survey, employees were asked if the felt that their work/life balance had changed – worsened or improved – since the introduction of Super 7 Operations. The result was twofold: very few people responded that the introduction of Super7 Operations hadn’t influenced their work-life balance. About half of the respondents indicated that the balance had worsened. But on the other hand, an equal part indicated that it had improved. For some, the plus-side of working shorter on quiet days outweighs the down side of working longer when necessary. And for others, flexibility results in challenges in the strict schedules of home and family. 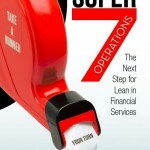 More on this topic can be found in my recent book: Super7 Operations – The Next Step for Lean in Financial Services. Available on Amazon.com, or for European readers Amazon.co.uk, Amanzon.de or Amazon.fr. This entry was posted in Uncategorized on January 8, 2014 by M.R. van Dijk.